Is Colonel Gaddafi a Frenchman? and has previously reported from New York and Brussels. If Colonel Gaddafi was so eager to linger in Paris when he came last December, it was perhaps because the Libyan leader is half French. His father was an air force pilot from Corsica. That's him in the picture on the left. This extraordinary claim has surfaced over the past few days after a report by Bakchich, a French investigative news site. They looked into a legend which has long circulated in Vezzani, a village of 600 people in eastern Corsica. According to this, a Vezzani gendarme's son called Albert Preziosi was stationed in the Libyan desert with the Free French air force in 1941-42. He is said to have had an affair with a local woman at about the time that young Muammar would have been conceived. Preziosi was killed when his aeroplane was shot down over Russia in 1943. As a member of the famous Normandy-Niemen squadron, he has been celebrated as a hero in his home village ever since. An air force base near the town of Solenzara, is named after him. Not a shred of evidence exists to stand up the Gaddafi legend but the physical resemblance is so strong that it has persisted. Officially, the father of the Supreme Guide of the Revolution was Abu Meniar Al Gaddafi, a Bedouin goat breeder in the region of Syrte. His mother, a local tribeswoman, was named Aisha. The Italian occupation and the war destroyed all records of the couple, according the French investigators. Preziosi is remembered by surviving comrades as a charmer. According to some, he talked about having a child in Libya. 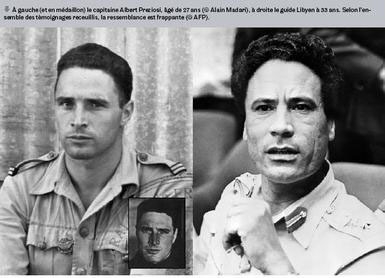 Pierre Lorillon, a Major who joined the squadron in Russia after Preziosi's death told Bakchich that his wartime comrades had no doubt about Gaddafi's paternity. "We all knew that Albert had had a girlfriend from the 'big Libyan tent', in other words a noble woman from the high bourgeoisie...We only knew that he had a child with this woman and that an uncle had taken care of her and sent her to study abroad". Members of Preziosi's family were reluctant to talk or said they knew nothing about a child, according to the site and French newspapers which picked up the story this weekend. Jacques-Antoine Preziosi, a nephew who is a Marseille lawyer, said that the family had nothing to confirm the legend and had never thought of investigating it. Jean-Pierre Pagni, the Mayor of Vezzani, told le Journal du Dimanche that Preziosi was the village hero. "We have no proof of this paternal link but nothing contradicts it either," he said. Bakchich dug up an exchange of letters between senior officers which showed that the air force History Service tried to investigate the story in 1999. A general concluded that the paternity was not possible because the Preziosi was based 600 kilometres away from Gaddafi's reported birth place. The news site quotes other squadron pilots who contradict this. Perhaps someone will end the mystery with a DNA check. In the meantime, some in Corsica are remembering that Gaddafi gave strong support to FNLC separatist guerrillas there in the 1970s. That is hardly evidence of filial attachment, since the colonel was handing out weapons and training to just about every terrorist outfit in those days.